As Thanksgiving Day approaches, it is customary to reflect on what we are thankful for. As mayor, and as a longtime resident and businessman on Hilton Head Island, I would like to share with you what I am thankful for as it relates to our island—our community. What better place to wake up than Hilton Head Island? Stop and think about being thankful for the loads of fun you can have here. Should I walk my dog through a neighborhood of roads adorned by live oaks or walk or drive a short distance to the beach? Do I play golf or tennis or ride a bike today? Do I catch a high school football, baseball, or basketball game today? Do I take my spouse or friend to the RBC Heritage Golf Tournament or maybe the Hilton Head Island Motoring Festival and Concours d’ Elegance? 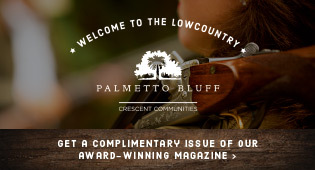 Shall we attend a play at the Arts Center of Coastal Carolina, or maybe attend a performance of the Hilton Head Symphony Orchestra? Maybe there were opportunities like these where you came from, but could they have been more convenient than here? I don’t think so. Do I check-out the annual Gullah Festival activities or one of the many festivals within minutes of home? Should I cast a rod or a shrimp net or go crabbing? We should be thankful for the fantastic array of wildly different but entertaining events and activities here. Before I travel, I look at my destination’s web page for “Things to Do.” When you think about all the things to do on Hilton Head Island, the list is endless. The island is heavily populated with talented residents, and I am thankful for that. As a result, whether one is working or retired, or even a student, tons of non-profit organizations represent the moral underbelly of our community. I have often written and spoken about the abundance of volunteers here. A sociological examination of our island would reveal that we are educated, pro-active, and motivated to support our fellow islanders with dollars and time. While the island receives awards on almost a monthly basis for our lifestyle, beaches, pathways, and natural resource protections, I wish there was a rating service that measured the heart of our community. We would compare favorably to any town in the U.S., and I am most thankful for that. 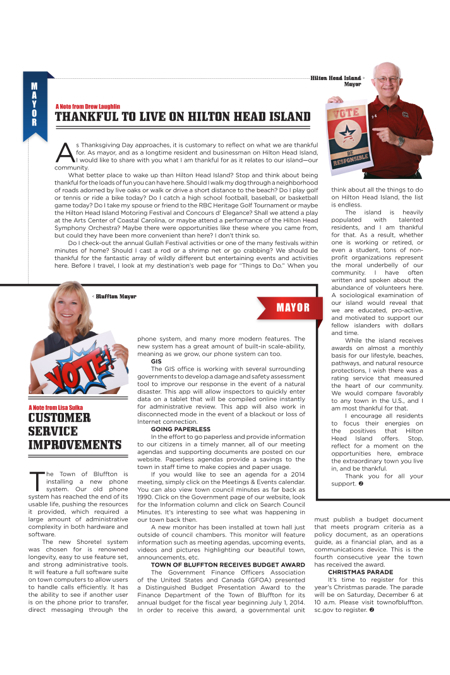 I encourage all residents to focus their energies on the positives that Hilton Head Island offers. Stop, reflect for a moment on the opportunities here, embrace the extraordinary town you live in, and be thankful. The Town of Bluffton is installing a new phone system. Our old phone system has reached the end of its usable life, pushing the resources it provided, which required a large amount of administrative complexity in both hardware and software. The new Shoretel system was chosen for is renowned longevity, easy to use feature set, and strong administrative tools. It will feature a full software suite on town computers to allow users to handle calls efficiently. It has the ability to see if another user is on the phone prior to transfer, direct messaging through the phone system, and many more modern features. The new system has a great amount of built-in scale-ability, meaning as we grow, our phone system can too. The GIS office is working with several surrounding governments to develop a damage and safety assessment tool to improve our response in the event of a natural disaster. This app will allow inspectors to quickly enter data on a tablet that will be compiled online instantly for administrative review. This app will also work in disconnected mode in the event of a blackout or loss of Internet connection. In the effort to go paperless and provide information to our citizens in a timely manner, all of our meeting agendas and supporting documents are posted on our website. Paperless agendas provide a savings to the town in staff time to make copies and paper usage. If you would like to see an agenda for a 2014 meeting, simply click on the Meetings & Events calendar. You can also view town council minutes as far back as 1990. Click on the Government page of our website, look for the Information column and click on Search Council Minutes. It’s interesting to see what was happening in our town back then. A new monitor has been installed at town hall just outside of council chambers. This monitor will feature information such as meeting agendas, upcoming events, videos and pictures highlighting our beautiful town, announcements, etc. The Government Finance Officers Association of the United States and Canada (GFOA) presented a Distinguished Budget Presentation Award to the Finance Department of the Town of Bluffton for its annual budget for the fiscal year beginning July 1, 2014. In order to receive this award, a governmental unit must publish a budget document that meets program criteria as a policy document, as an operations guide, as a financial plan, and as a communications device. This is the fourth consecutive year the town has received the award.